Niederanven, Houffalize and Meerssen meet up in the Benelux Meeting on January 13th! On Saturday Douzelage Houffalize, Meerssen met in Niederanven. A special guest was welcomed: Fernand Jadoul, honorary consul of Luxembourg. Apart from the ‘oldies’, the young generation of Niederanven and Meerssen was present as well. 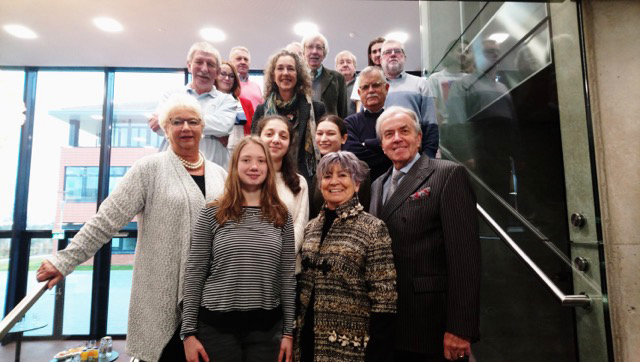 To begin with, the ambitious and very interesting youth project of Houffalize (freely translated): “The immersion project of young Europeans from partner towns of Douzelage. Awareness of European History, democratic and civil engagement and participation in tomorrows Europe. Thirteen Douzelage partners will each sent five youngsters (aged 16 to 22) accompanied by two adults. During one week of intensive, pro active and interesting projects, they will be ready for the future of Europe! A pilot of Via Douzelage will take place coming April. The bikes will hopefully be ready for an extended trip from Niederanven to Houffalize and back to Meerssen. It will be a kind of Via Douzelage in Benelux tour. After their pilot, they will focus on the next tour which will include Bad Kötzting and Susice. Mutual aim is to find not only the right path, but European cross border sportive engagement. Last but not least Meerssen hopes to welcome seniors from Niederanven in the near future. It will be a roundtrip full of culture, typical landscapes from Limburg and… culinary delights from this Dutch region. After having had a very tasty lunch in the company of very pleasant people, the delegates shifted over to the ‘Jugendhaus’: the house of the Young. In this house youngsters aged 14 to 22 are able to ‘hang out’. It’s a very comfy place, feels like home, but fortunately there are no parents. No wonder they like being in the Jugendhaus! Niederanven, Houffalize and Meerssen had a great day and feel fortunate of having their Benelux friends so close to home!